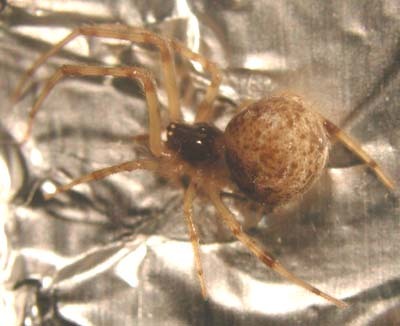 This is an extremely common spider that you will see in barns and houses. It likes to build its webs in corners of rooms and under windows. It usually stays in its web all the time. 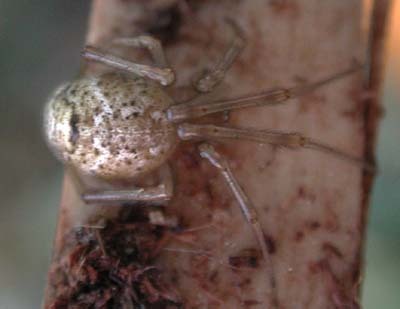 The egg sac is present in the web and is brown and circular. See below picture. Here you can see the large circular abdomen and the brown markings. 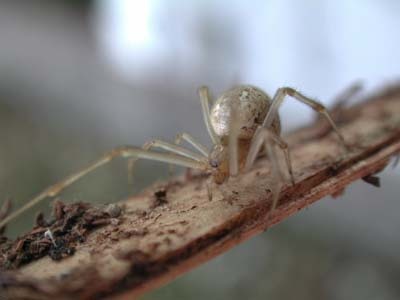 There are combs, that are difficult to see in this species, on the hind legs with which the spider flings its silk onto its prey. (Hence its name). Spider in life. Notice the eyes clumped at the end of the head. Shot showing the beautiful markings on the abdomen. Notice how the front legs can come up and reach in front, over the head. 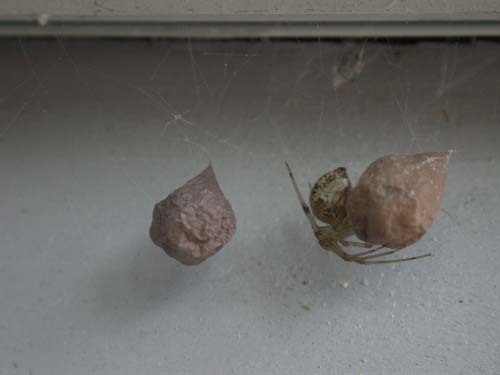 Picture showing the spider with its egg sac, this spider is under a window sill outside of my house. Notice how the web is rather irregular and the spider is inverted, the position that it likes to retain. This spider also was sharing its web with three other spiders. LOCATION: Throughout the United States and also Canada.